Cougars once roamed the entire expanse of the lower forty-eight United States, up into the Canadian Yukon, and south to Chilean Patagonia in South America. 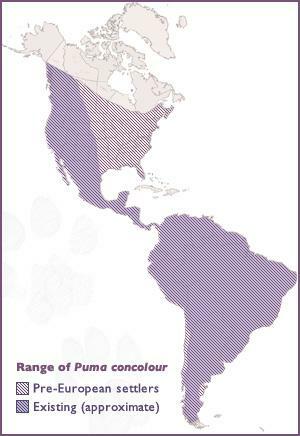 Puma concolor is historically the widest ranging land mammal in the Western Hemisphere, aside from humans. A habitat generalist and highly-adaptive, the cougar once roamed the entire expanse of the contiguous forty-eight United States. Today, cougar populations are officially recognized by state Game and Fish Departments in sixteen states: Washington, Oregon, California, Arizona, Colorado, Utah, Idaho, Wyoming, Montana, Nebraska, New Mexico, Nevada, Texas, Florida (as subspecies Puma concolor coryii), North Dakota, and South Dakota. Cougars are listed as endangered in Florida and protected from sport hunting by law in California. Increased sightings in the Midwest, including Nebraska, Missouri, Indiana, Michigan, Wisconsin and Kansas, are leading to valuable scientific research on the possible viability of cougar populations in these states. Outside of the United States, Cougars also range throughout Mexico, Central, and South America, although the status of their range is not entirely known. Cougars are legally hunted for sport, in thirteen states: Arizona, Washington, Oregon, Colorado, Utah, Idaho, Wyoming, Montana, New Mexico, Nevada, North Dakota, South Dakota, Nebraska, and Texas. Cougar hunting is regulated by each state’s Wildlife Department in all of the above states except for Texas, where the cougar is classified as varmint and may be killed at any time and in any manner. In Texas, killing a cougar is not required to be reported to officials. Traditionally, cougars are hunted with the aid of dogs. Cougars also range throughout Mexico and Central and South America, although the status of their populations in these regions is not entirely known.